Last September’s market report for the greater Vancouver region confirmed that the Vancouver real estate market is still smoking hot. 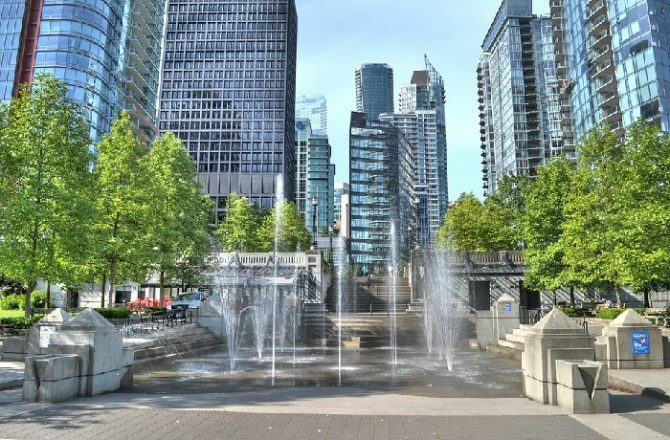 Residents and condo investors are hunting for bargain properties as are students studying at UBC, Langara College and SFU. This is called student hotel housing and it’s proving to be lucrative for student housing companies. The new sales and price numbers below from Royal Lepage, CREA, and REBGV may depress you a bit if your ambition is to own a new or resale condo in the city or even to rent one. Sales of detached million dollar homes have abated, yet it’s just a switch to a focus in condomiums in Vancouver. This switch has also happened in the Toronto condo market. The challenge for condo buyers is finding on at any price level they can afford. I’m sure you’re finding the rental housing and condo buying situation very difficult and you may find Surrey, Richmond, and Langley your best bets. Prices of condos have jumped as much as 35% in some areas, and overall prices of apartment condos in Vancouver have jumped an incredible 21.7% from last September. In September CREA reported condo apartment sales growth of 19% in greater Vancouver above that of September 2016. Will that continue in 2018? There’s been a lot of talk about housing market crashes in 2018, but wishful thinking might what’s behind it. At this point (October 2017) experts forecasted that housing markets across North America would be in a crash or deep decline, but it hasn’t happened. It probably own’t here or in US housing markets. 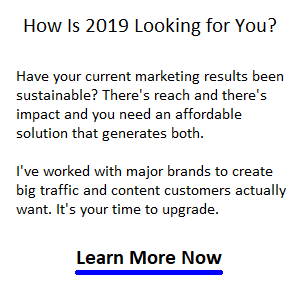 Demand is high and the economy may get stronger. The Real Estate Board of Greater Vancouver (REBGV) reports that residential property sales in the region totalled 2,821 in September 2017, a 25.2% increase from the 2,253 sales recorded in September 2016, and a 7.3% decrease compared to August 2017 when 3,043 homes were sold — from CREA October report. There were a total of 1491 apartment condos sold in September with an average HPI benchmark price of $635,800. 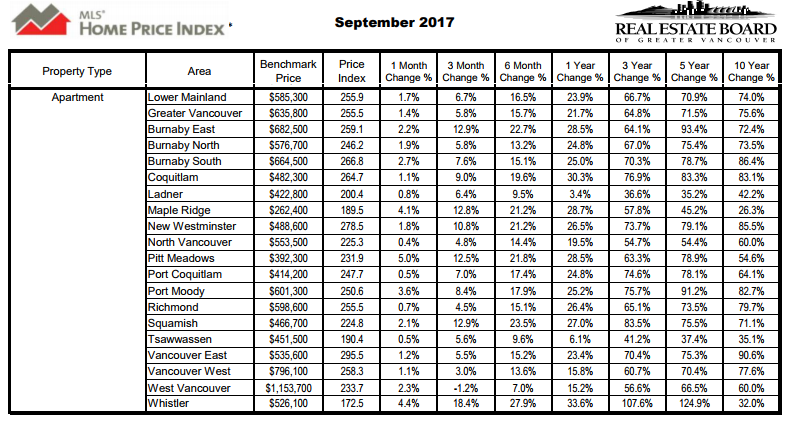 the price growth over the last year is astonishing with North Vancouver and New Westminster leading. The numbers above suggest Richmond, Surrey and Burnaby are where you’ll find an affordable condo. Surrey and Langley may be the future. You’ll find a lot of student housing new construction projects in this area too close to the skytrain and the major schools. Unfortunately, you will be competing with the families of wealthy students for the units who are searching off campus in the Vancouver area. How Do the Forecasts Look? With the economy faring better, most forecasters may even upgrade their 2018 forecast for Toronto housing and the Toronto Condo market forecast, along with the Vancouver region forecast which are the only housing markets doing well. The rest of the country is hanging on with spillover from the big cities. When the foreign buyers tax was implemented in BC and Toronto, I suggested that instead, incentives should be provided to property investors and builders to build in areas outside of Vancouver and Toronto. Unrealistic? Long term, it benefits everyone. These housing shortages including student housing shortages are significant economic and personal issues. It could end in a crash. Still the spillover has helped Kelowna, Calgary, London, Waterloo, and Ottawa. The situation for many renters is definitely a crisis. There is an exaggerated need for rental properties and housing for students. One estimate is there are more than 24,o00 families in need of housing in Vancouver and many of them may involve students studying in colleges in Richmond. Recently 300 buyers showed up to apply for a few coop units up for sale. If new builds decline because of a fear of rent controls and then Canadian interest rates rise, this could make the forecast gloomy. Vancouver residents need to get more active and encourage local politicians to adopt a new attitude toward the crisis. A new socialist driven research project called Cambie Corridor is being conducted to see if a restriction on development to force lower rents will work. In a few years, we’ll have data, but in the meantime, why would the condominium builders not just stop building in Vancouver? Builders need incentives, where that is just a money losing proposition. They can’t create $850 apartments in Vancouver’s pricey atmosphere. There’s a lot of belief in magic in some government quarters but the current crisis shows how badly mismanaged housing in Vancouver is. The city awash in beautiful condo buildings however the units are out of reach of most buyers. One could ask who the builders are building for if few are able to finance them? New government housing projects could create coop affordable units, but would they turn into another LA styled Watts neighbourhood, with crime and malaise? Now we understand the wish for a Vancouver housing market crash. The previous BC government failed badly in using old school tactics to solve an International level challenge. Rightfully, they were ousted, and now we’ll see if the NDP can actually deliver on their promise to lower income buyers and renters. Supply must be increased in Vancouver as the city just gets more popular. And for most homebuyers in the Vancouver area, detached houses aren’t even a thought since the average price has hit $1,617,300 which is up almost 3% since last year. Condo hunters will have to be more persistent, patient and creative to land a condo to call home. A solution that may support increasing availability is to open up land for development outside of Vancouver up the coast and out on Vancouver Island, or into the interior. With Federal and BC government incentives and tax support for this (take it from the foreign buyers levy — $billlions of dollar tax grab for what purpose?. This could be used to draw businesses out into new outlying communities. Many businesses don’t actually need to be in Vancouver. If they had an opportunity to move somewhere cheaper, they’d do it. They’d get away from the congestion too. People want to live near the jobs, thus moving the jobs outward will take the pressure off and open up amazing new cities across BC. Places like the Comox Valley and Sunshine Coast and Nanaimo would welcome the growth.